Suicide is among the leading causes of death in the United States. 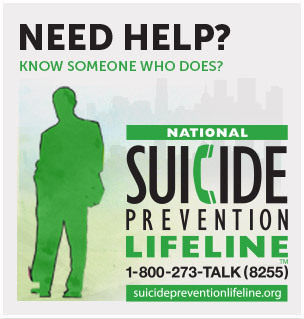 For each suicide, there are many other individuals who have attempted or who are seriously thinking about suicide. There are many reasons why people think about and attempt suicide. And, when suicides and suicide attempts occur, individuals, families, and communities can experience physical, emotional, and economic consequences. We can work together to stop suicide before it happens. Communities can educate people about suicide and warning signs, increase awareness of available support services, and support people at risk for suicide so they can receive help. Download a valuable fact sheet about suicide and how we can prevent it.